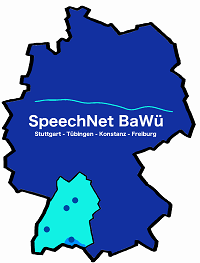 SpeechNet BaWü is a research network of (female) experimental linguists working on speech. The scientists are located at the southern German universities of Freiburg, Konstanz, Tübingen, and Stuttgart. The members of SpeechNet have expertise in cross-language and native- versus second-language processing with special focus in prosody and in listening to variable and accented speech, with different methodological approaches. The network provides a platform for mutual exchange on experimental speech research in the region (and beyond), thereby enriching the scientific learning experience for early career researchers and fostering national and international collaborations. Witteman, M. J., Bardhan, N. P., Weber, A., & McQueen, J. M. (2015). Automaticity and stability of adaptation to foreign-accented speech. Language and Speech. 52(2), 168-189. Weber, A., Di Betta, A. M., & McQueen, J. M. (2014). Treack or trit: Adaptation to genuine and arbitrary foreign accents by monolingual and bilingual listeners. Journal of Phonetics, 46, 34-51.
foreign-accented speech. Psychonomic Bulletin & Review, 21, 512-519.
learning in accented speech. Frontiers in Psychology, 4: 148. Reinisch, E., Weber, A., & Mitterer, H. (2013). Listeners retune phoneme categories across languages. Journal of Experimental Psychology: Human Perception and Performance, 39, 75-86. Witteman, M. J., Weber, A., & McQueen, J. M. (2013). Foreign accent strength and listener familiarity with an accent co-determine speed of perceptual adaptation. Attention, Perception & Psychophysics, 75, 537-556. Weber, A., Broersma, M., & Aoyagi, M. (2011). Spoken-word recognition in foreignaccented speech by L2 listeners. Journal of Phonetics, 39, 479-491. Cutler, A. & Weber, A. (2007). Listening experience and phonetic-to-lexical mapping in L2. Proceedings of the 15th International Congress of Phonetic Sciences, (pp. 43-48). Saarbru?cken. Cutler, A., Weber, A., & Otake, T. (2006). Asymmetric mapping from phonetic to lexical representations in second language listening. Journal of Phonetics, 34, 269-284. Weber, A. & Cutler, A. (2006). First-language phonotactics in second-language listening. Journal of the Acoustical Society of America, 119, 597-607. Weber, A. & Cutler, A. (2004). Lexical competition in non-native spoken-word recognition. Journal of Memory and Language, 50, 1-25.
particles, Germans intonation. Journal of Pragmatics, 62, 94-106. Braun, B., Galts, T. & Kabak, B. (2014). Lexical encoding of L2 tones: the role of L1 stress, pitch accent and intonation. Second Language Research, 30(3): 323-350. Dehé, N. & Braun, B. (2013). The prosody of question tags in English. English Language and Linguistics, 17(1), 129-156. Grohe, A.-K. & Braun, B. (2013). Implicit learning leads to familiarity effects for intonation but not for voice. Proceedings of the 14th Annual Conference of the International Speech Communication Association. Lyon, France. Turco, G., Dimroth, C., & Braun, B. (2013). Intonational means to mark verum focus in German and French. Language and Speech, 56, 460-490. Advance online publication (2012). DOI: 10.1177/0023830912460506. Altmann, H., Berger, I., & Braun, B. (2012). Asymmetries in the perception of non-native consonantal and vocalic length contrasts. Second Language Research, 28(4), 387-413. Braun, B., & Johnson, E.K. (2011). Question or Tone 2? How language experience and linguistic function guide pitch processing. Journal of Phonetics, 39(4), 585-594. Braun, B., Lemhöfer, K. & Mani, N. (2011). Perceiving unstressed vowels in foreignaccented English. Journal of the Acoustical Society of America, 129, 376-387. Braun, B., & Tagliapietra, L. (2011). On-line interpretation of intonational meaning in L2. Language and Cognitive Processes, 26(2), 224-235. Braun, B., Dainora, A., & Ernestus, M. (2011) An unfamiliar intonation contour slows down on-line speech comprehension. Language and Cognitive Processes, 26 (3), 350-375. Braun, B., & Chen, A. (2010). Intonation of 'now' in resolving scope ambiguity in English and Dutch. Journal of Phonetics, 38 (3), 431-444. Braun, B., Taliapietra, L., & Cutler, A. (2008). Contrastive utterances make alternatives salient: cross-modal priming evidence. In Proceedings of Interspeech 2008 . Brisbane, Australia. 69-69. Braun, B. (2006). Phonetics and phonology of thematic contrast in German. Language and Speech, 49(4) 451-493. Braun, B., Kochanski, G., Grabe, E., & Rosner, B. S. (2006). Evidence for attractors in English intonation. Journal of the Acoustical Society of America, 119(6) 4006-4015. Braun, B., Weber, A., & Crocker, M. W. (2005). Does narrow focus activate alternative referents? In Proceedings of the 9th European Conference on Speech Communication and Technology . Lisbon, Portugal. 1709-1712. Raborife, M.I., Ewert, S. & Zerbian, S. (2015). Improving a tone labelling algorithm for Sesotho. Language Resources and Evaluation, 49, 19-50. English. English World-Wide, 36(2), 228-258. Zerbian, S. (2015). Prosodic marking of focus in transitive sentences in varieties of South African English. In Gut, U., Fuchs, R. & Wunder, E. (eds.) Universal or diverse paths to English Phonology. Berlin: De Gruyter. pp. 209-240. Marking. In Delais-Roussarie, E., Avanzi, M., Herment, S. (eds.) Prosody and Language in Contact: L2 Acquisition, Attrition and Languages in Multilingual Situations. Berlin: Springer. pp. 7-27. English. English World Wide, 34(1), 26-47. Zerbian, S. (2012). Perception and interpretation of intonational prominence in varieties of South African English. K. Braunmu?ller & C. Gabriel (eds. ), Multilingual Individuals and Multilingual Societies. Benjamins Publishing Company, Amsterdam. pp. 335-348. Africa: A Festschrift for Justus C. Roux. Stellenbosch: SUN PRESS. pp. 1-20. Swerts, M. & S. Zerbian, S. (2010). Intonational differences between L1 and L2 English in South Africa, Phonetica, 67: 127-146. Zerbian, S. & E. Barnard (2010). Realization of two adjacent high tones - Acoustic evidence from Northern Sotho", Southern African Linguistics and Applied Language Studies 28(2), 101-121. Zerbian, S. & E. Barnard (2008). Phonetics of intonation in South African Bantu languages, Southern African Linguistics and Applied Language Studies 26(2), 235-254. Hanulikova, A. (2012). Metrical segmentation strategy in German. In Spalek, K., Domke, J., Grommes, P. (eds. ), Erwerb und Kontext: Beiträge zu sprachlichen Vergleichen, Varietäten, Variationen. Festschrift fu?r Rainer Dietrich. Tu?bingen: Stauffenburg Verlag. Learning, 62(Supplement S2), 79-109. doi:10.1111/j.1467-9922.2012.00707.x. processing. Journal of Cognitive Neuroscience 24 (4), 878-887. Psychophysics, 74 (3), 613-629. doi:10.3758/s13414-011-0259-7. Hanulikova, A., Mitterer, H., & McQueen, J. M. (2011). Effects of first and second language on segmentation of non-native speech. Bilingualism: Language and Cognition, 14, 506-521. doi:10.1017/S1366728910000428. Hanulikova, A., & Weber, A. (2010). Production of English interdental fricatives by Dutch, German, and English speakers. In New Sounds 2010: Sixth International Symposium on the Acquisition of Second Language Speech (pp. 173-178). Poznan: Adam Mickiewicz University. 31.8.-1.9.2017 at the University of Tuebingen. Doctoral students working on different aspects related to prosody processing in different languages are invited to present their work. For workshop details klick here. !! !SpeechNet BaWü and Prof. Anne Cutler (University of Western Sydney) have received funding (16.000 Euro) under the 2015-2016 Universities Australia – Germany Joint Research Cooperation Scheme for the project “Processing prosody across languages, varieties and nativeness”!! !